This month's first entry was mostly about viewing planets. This time, let's look at what star patterns and constellations are available. What? You ask, "Aren't constellations star patterns?" The answers is, well, yes...and no. Here's how that can be: let's look at one of the best star patterns of the late summer sky, down low on the southern horizon right after dark. It looks like a sprawling 'S' sort of lying on its side. 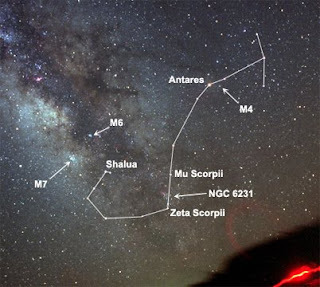 This is the outline of the scorpion, Scorpius. On the right or westward end you'll find three equally bright stars in a row. This is the scorpion's head. The curve of stars to the east of (or behind) the head outlines the body of the scorpion right down to the stinger at the tip of the tail. Sounds like the constellation we all know, right? Almost. The shape we see is really just the asterism - the shape we give the stars of a particular group. 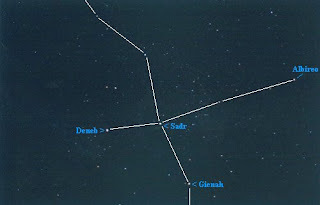 Another really good example is the Big Dipper. While it's one of the best known star groups, what we mostly refer to is the asterism of the big bowl with a long handle. The actual constellation of the scorpion is Scorpius but the actual constellation of the Big Dipper is Ursa Major - the Big Bear. You see, an asterism is just the shape we see in a particular group of stars. A constellation is not only a shape but an entire area of sky in which the shape is included. Here's why: when we look into the sky we really are looking into the sky. For the most part it appears to be two dimensional (like flat), but it's 3-dimensional. Beyond the bright stars are more distant stars, nebulae and galaxies much deeper into space. In fact, most are so far from us that despite their enormous size and brightness, we still cannot see them without optical aid. So a 'constellation', as in an area of the sky includes not only the shape of the stars within and all the visible stars but also all of the stars, galaxies, nebulae and other stuff too far away to be seen either with or without optical aid! star between Sadr and Albireo. The five brightest stars of Cygnus form the 'cross' shape, but did you know that the first known black hole is located right in Cygnus along the long axis of the cross? 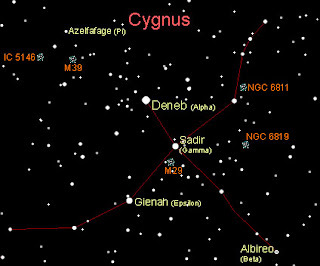 Or that the bright star Deneb, located at the top of the cross, radiates 54,000 times more energy than our sun? Doesn't look so bright though does it? 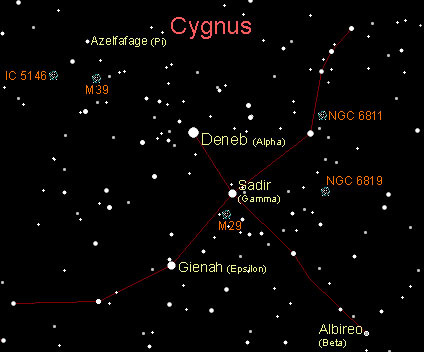 No, but that's because Deneb is 1,550 light years away....The light we see today left Deneb around the time of the death of Attila the Hun! 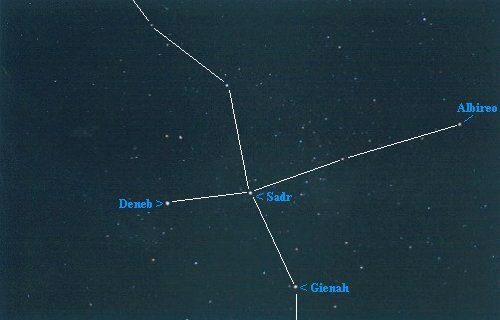 We can't see them because of their distance but here are millions of stars farther out behind Deneb. 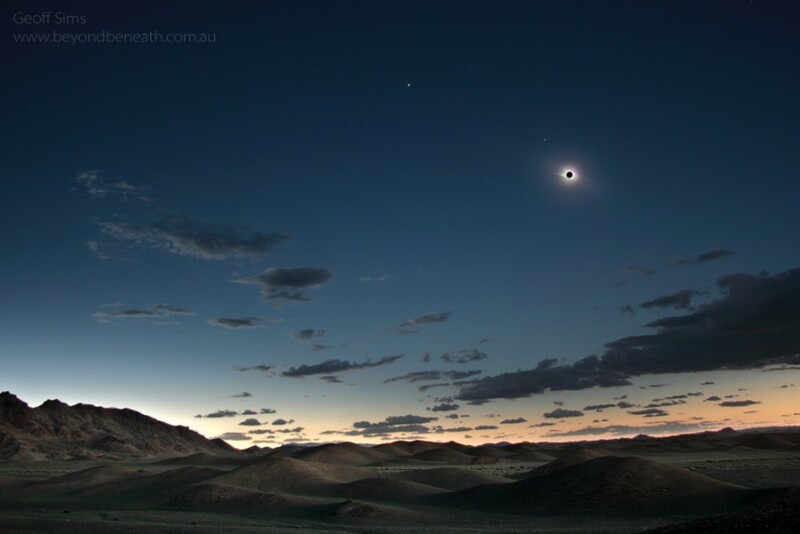 Over on the western horizon around 8 p.m. the bright orange star Arcturus of the constellation Bootes (pr. Boo-OH-teez) gleams brightly. To its right is the Big Dipper. The scorpion is to the left of Arcturus and above Bootes is the keystone shape of Hercules. Over in the east, the Great Square of Pegasus, the main constellation of the Autumn sky is above bright Jupiter. Next week I'll point out the binocular jewels of this month's night sky!